Bulk Trash pickup is a service offered thru the Waste Management Contract. Items that are too large to fit in your trash can may be placed at the curb. Do not place any items in the street or on water meters. 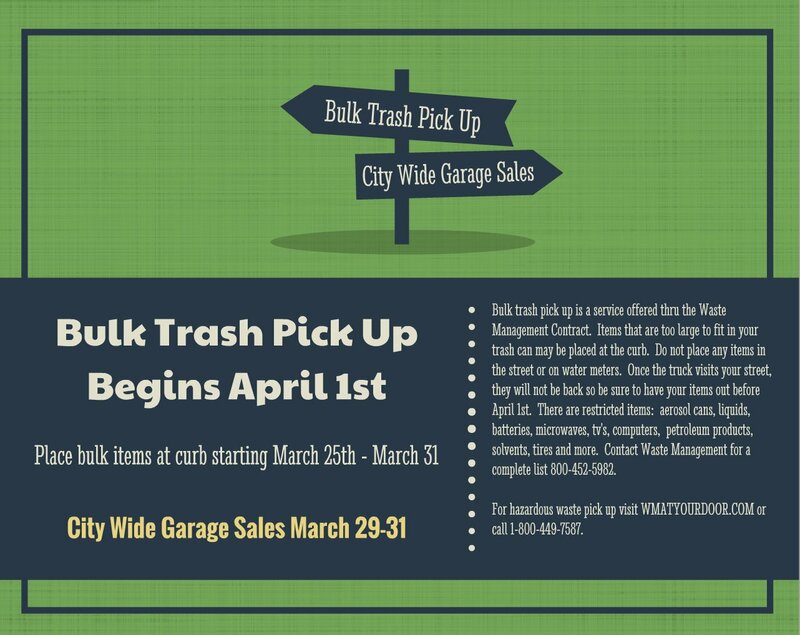 Once the truck visits your street, they will not be back so be sure to have your items out before April 1st. There are restricted items: aerosol cans, liquids, batteries, microwaves, tv's, computers, petroleum products, solvents, tires and more. Contact Waste Management for a complete list 800-452-5982. For hazardous waste pick up visit WMATYOURDOOR.COM or call 1-800-449-7587. Incorporated in 1960, City founders considered the Interstate 35 and Loop 1604 interchange a perfect location amid gently-rolling hills.